Low back pain is common. Almost everyone has back pain at some time in their life. Often, the exact cause of the pain cannot be found. A single event may not have caused your pain. You may have been doing many activities, such as lifting the wrong way, for a long time. Then suddenly, one simple movement, such as reaching for something or bending from your waist, leads to pain. You may have had a herniated disk, in which part of the spinal disk pushed onto nearby nerves. Normally, the disks provide space and cushion in your spine. If these disks dry out and become thinner and more brittle, you can lose movement in the spine over time. 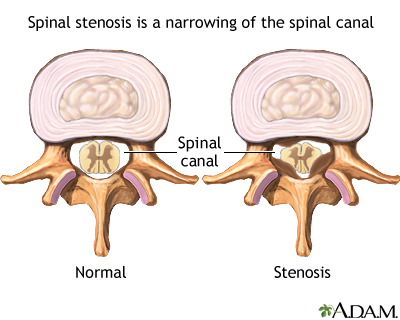 If the spaces between the spinal nerves and spinal cord become narrowed, this can lead to spinal stenosis. These problems are called degenerative joint or spine disease. Low back pain can differ from person to person. The pain may be mild, or it can be so severe that you cannot move. During the physical exam, the health care provider will try to pinpoint the location of the pain and figure out how it affects your movement. Other tests you have depend on your medical history and symptoms. Your back pain may not go away completely, or it may get more painful at times. Learn to take care of your back at home and how to prevent repeat episodes of back pain. This can help you continue with your normal activities. If your pain does not improve with medicine, physical therapy, and other treatments, your provider may recommend an epidural injection. Spinal surgery is considered only if you have nerve damage or the cause of the back pain does not heal after a long time. In some patients, a spinal cord stimulator can help reduce back pain. Most back problems get better on their own. Follow your provider’s advice on treatment and self-care measures. Call your provider if you have severe back pain that does not go away. Call right away if you have numbness, loss of movement, weakness, or bowel or bladder changes. Abd OE, Amadera JED. Low back strain or sprain. In: Frontera WR, Silver JK, Rizzo TD Jr, eds. Essentials of Physical Medicine and Rehabilitation: Musculoskeletal Disorders, Pain, and Rehabilitation. 3rd ed. Philadelphia, PA: Elsevier Saunders; 2015:chap 48. Manchikanti L, Abdi S, Atluri S, et al. An update of comprehensive evidence-based guidelines for interventional techniques in chronic spinal pain. Part II: guidance and recommendations. Pain Physician. 2013;16(2 Suppl):S49-S283. PMID: 23615883 www.ncbi.nlm.nih.gov/pubmed/23615883.